A turnout of 1057 – the weekend’s fourth-highest league attendance in Scotland – squeezed into the Capital venue for the match of the day in the lower leagues. However, in truth, it failed to live up to its pre-match hype. Jim McInally and his Peterhead players headed down the tunnel at full-time the more satisfied having maintained their five-point advantage over the Citizens at the top – although new dad Rory McAllister passed up three gilt-edged chances in the opening 45 minutes that would have put the Blue Toon out of sight. City upped their game in the second half with Bradley Donaldson and Blair Henderson both heading wide of the target when they perhaps should have done better. However, Clyde’s last-gasp win against Annan means Danny Lennon’s side are now just a point behind City with six games left to play despite their four-point deduction earlier this month for fielding an ineligible player. The Bully Wee welcome Peterhead to Broadwood in 12 days with Clyde visiting City just a week later. 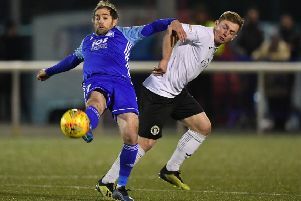 “We were disappointing in the first half and Peterhead could have been two or three up to be honest,” City boss James McDonaugh said afterwards. “But I think the game turned after the break and we then became the team looking to try and win the game. “Callum [Antell] kept us in it with some key stops and they really should have been 1-0 up inside the first minute. He’s earned another clean sheet, his 15th of the season so that’s a fantastic return. He allowed us a chance at half-time to fix a few things. We were good in the second half up to a point where we probably didn’t create enough. “It would have been a great game to win and a bad game to lose. We’re not happy with a draw but we’re still hanging in there with six games to go. The best team wins the league so if Peterhead do go to cross the line in first then that’s four times we’ve played them and they haven’t beaten us so that’s credit to my guys. McAllister passed up the first of a hat-trick of opportunities inside 30 seconds when he profited from Marc Laird’s slack pass to run through on goal. The former Inverness striker looked destined to score but was denied by an excellent stop from Antell, whose outstretched hand pushed the ball to clip the outside of the post. It was Donaldson’s turn to then be dispossessed just moments later that allowed McAllister through again but Antell stood firm to hold the shot. A Willie Gibson free kick had the Welshman scrambling in the home goal just before the half hour, but the former Hibs keeper used every inch of his 6ft 3in frame to tip the ball over. McAllister spurned another chance in front of goal before Scott Shepherd threatened at the other end but was let down by his cutback from inside the box. The hosts increased the tempo in the second half as they sought that elusive goal that would narrow the gap to two points, and despite efforts from Henderson, Donaldson and captain Craig Thomson, the Peterhead goalkeeper, Greg Fleming, enjoyed a fairly tame afternoon. Edinburgh City: Antell, Donaldson (Galbraith 67), Thomson, McIntyre, L Henderson, Black, Balatoni, Laird, B Henderson, Shepherd (Rodger 87), Watson (Taylor 76). Subs: Morton, MacDonald, Kennedy, Diver. Peterhead: Fleming, Home, Boyle, Brown, Dunlop, Dow (Eadie 83), Stevenson (Willis 19), Brown, McAllister, Sutherland (Willox 69), Gibson. Subs: Henderson, McCracken, McDonald.